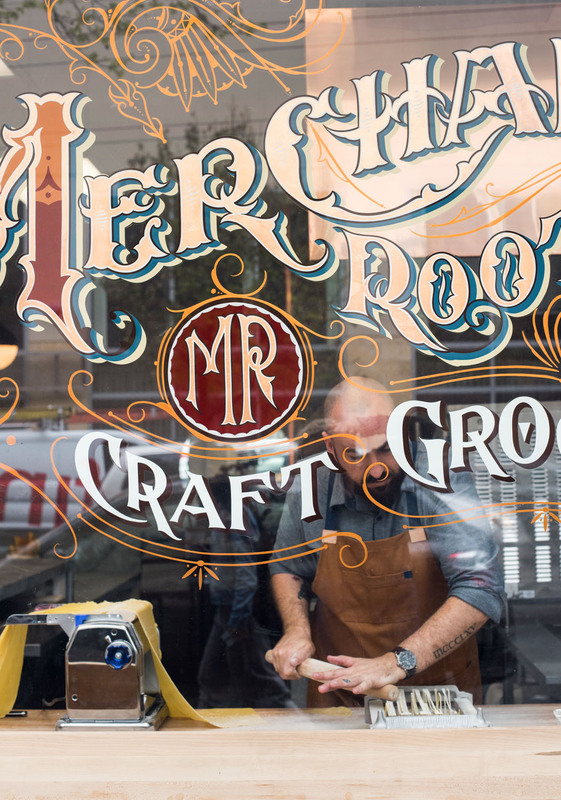 The oversized windows are hand painted with the Merchant Roots logo, created by local artist Ken Davis. Is there anything better than fresh pasta? 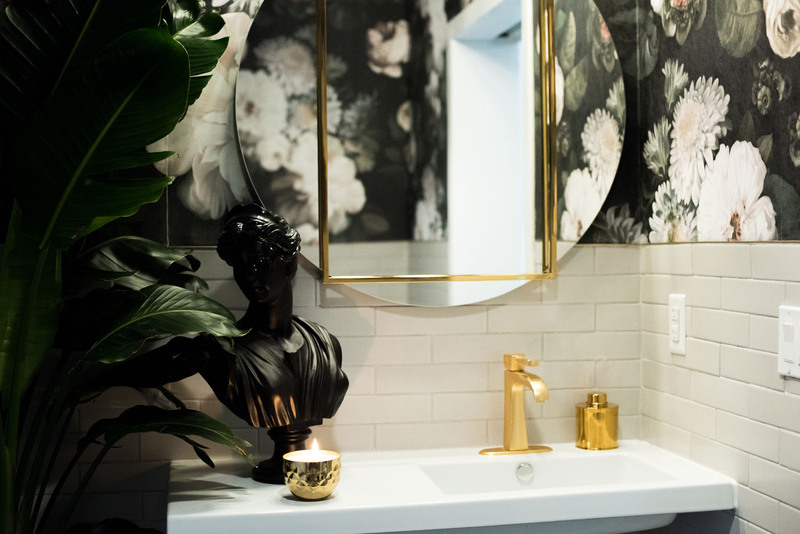 The bathroom is a total departure from the bright, airy space. Ever wish you could skip the chain super market and just buy all your groceries the day you plan to cook with them from a local grocer? 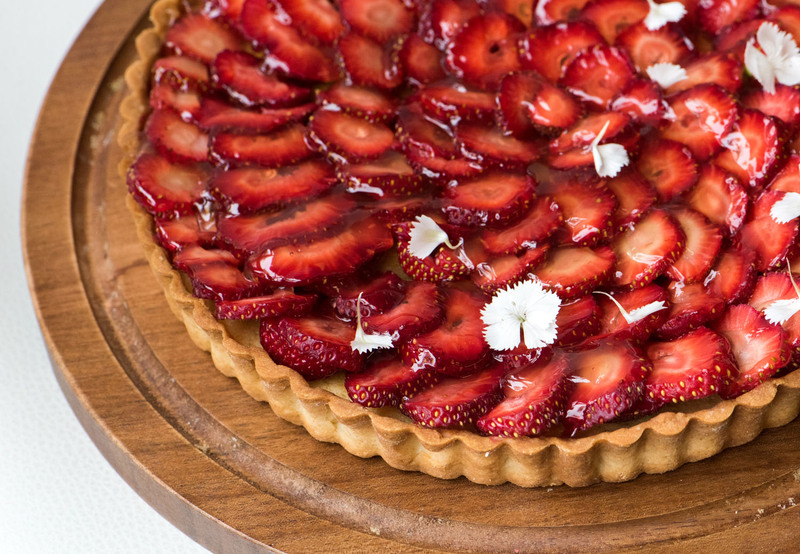 Ever wish fine dining felt a little more focused on quality food and a little less on all that other stuff? Well, Merchant Roots is meant to fill exactly that void. 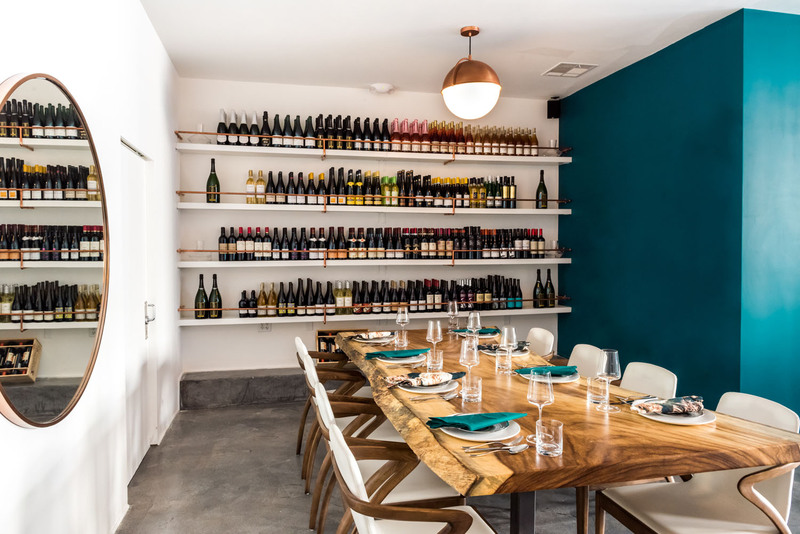 Merchant Roots is San Francisco’s first craft grocer and fine-dining restaurant, founded by sommelier Madison Mischael and Chef Ryan Shelton. 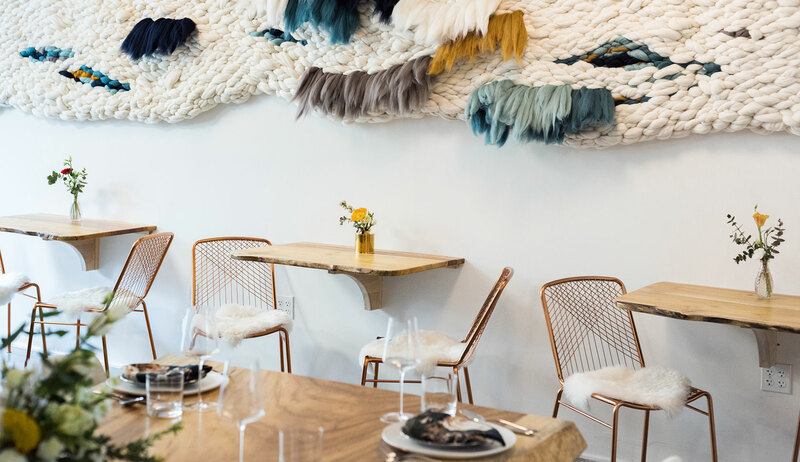 It’s a specialty food store and wine shop, casual eatery, and upscale tasting menu dinner experience — all under one roof. 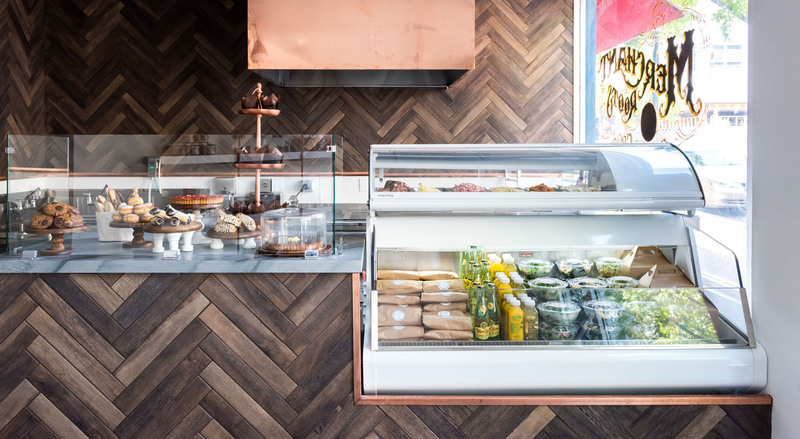 During the day they serve freshly made fare including house made pastries, sandwiches, salads, fresh pasta, cheese, and charcuterie, as well as gourmet pantry items like specialty salts, jam, chocolate, and wine. At night, it’s fine dining around The Table at Merchant Roots, which will be a unique experience featuring themed tasting menus that change every six weeks. According to Madison, “We’re serving just eight guests per seating, so it will feel like an intimate, whimsical dinner party.” To capture that feeling the moment you sit down, Madison had a gorgeous live-edge wood table fashioned from sustainable Money Pod tree, custom made by woodworker Ian Avidan of Berkeley-based Z&E Slabs. 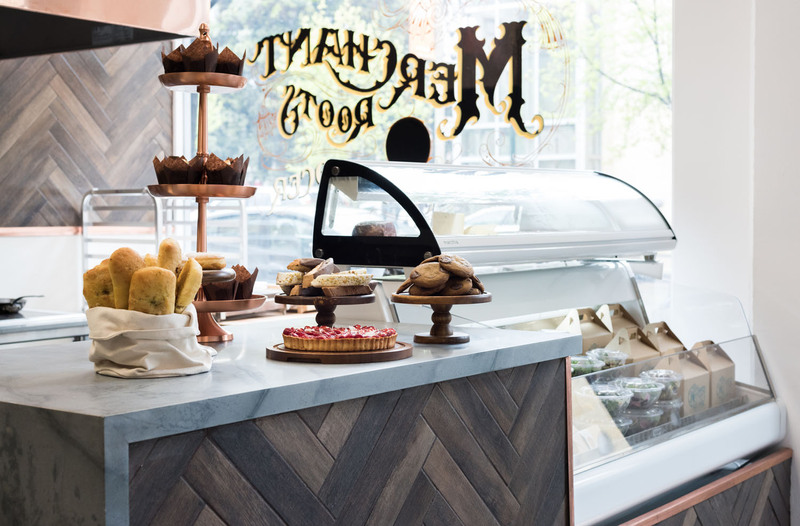 Madison also designed the entire interior of Merchant Roots herself, in addition to developing the wine program and bringing this modern grocery to life. 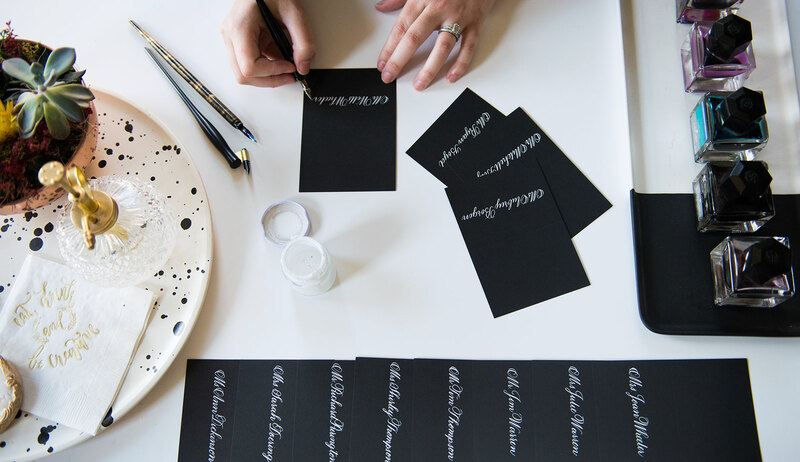 She shares more about her process with us below and you can see more of Merchant Roots in the slideshow! 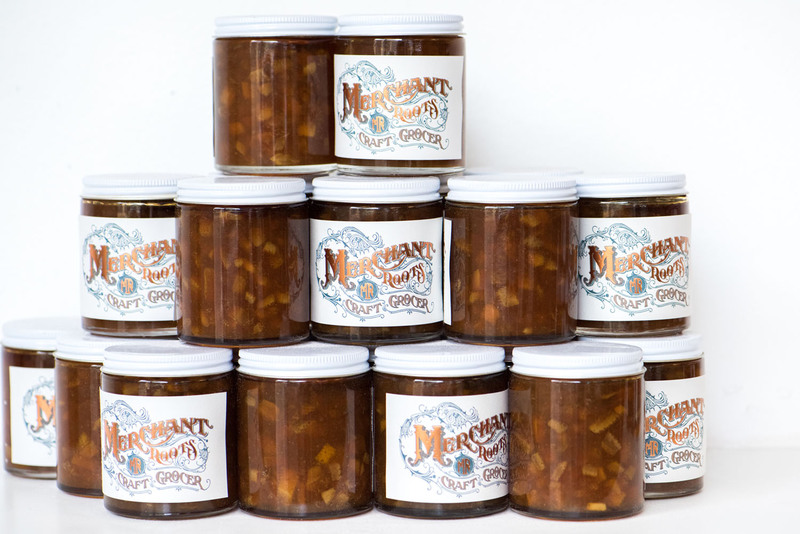 Merchant Roots has a lot going on under one roof. How did you create a space that worked during the day for counter service and a grocery and by night for fine dining? Versatility is the key to success! 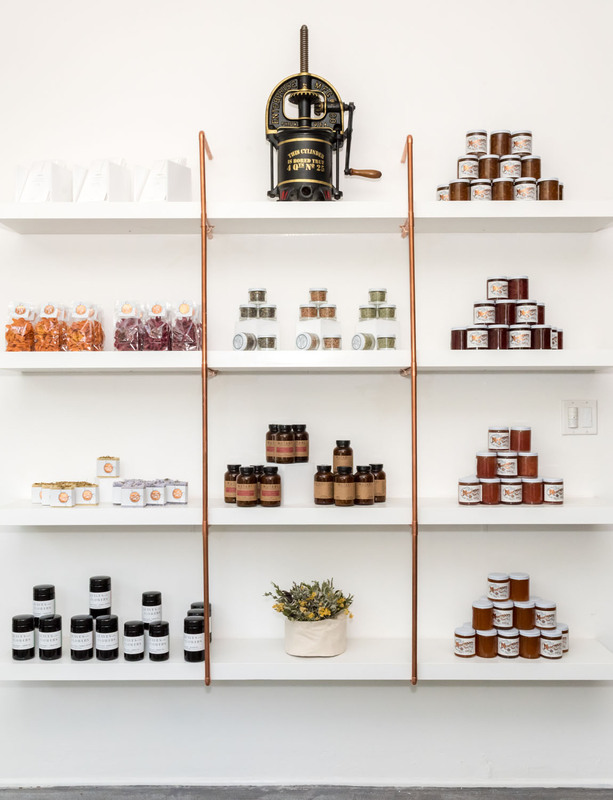 Merchant Roots’ design is minimalistic to establish a neutral canvas for both craft grocer and restaurant components, but it’s purposely and thoughtfully designed for each use. 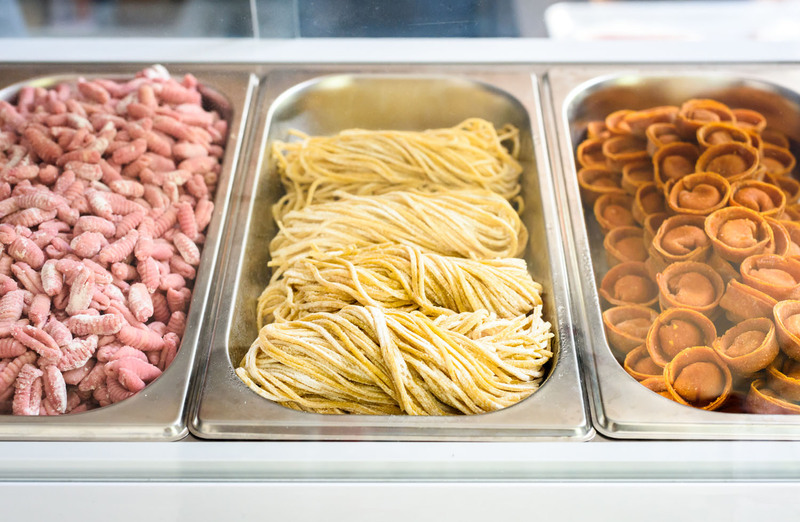 We have a street-facing pasta counter where passersby can observe the pasta making process, and it functions as daily entertainment for some people, which is so fun. 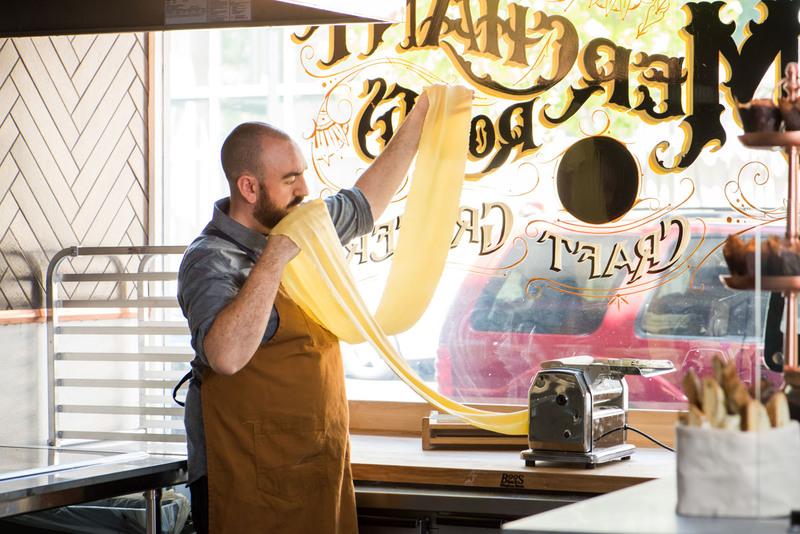 That draws a lot of interest and brings customers into the shop, where they’re rewarded with either a casual dine-in meal of fresh pasta, sandwich, or salad — or they buy pasta and sauce to prepare at home. Chef Ryan’s tasting menus are served The Table, which is tucked around the corner away from the grocer counter so there’s a level of privacy, but it doesn’t negate the fact that you’re dining inside of a mixed-use space; that’s by design as that’s part of the experience. 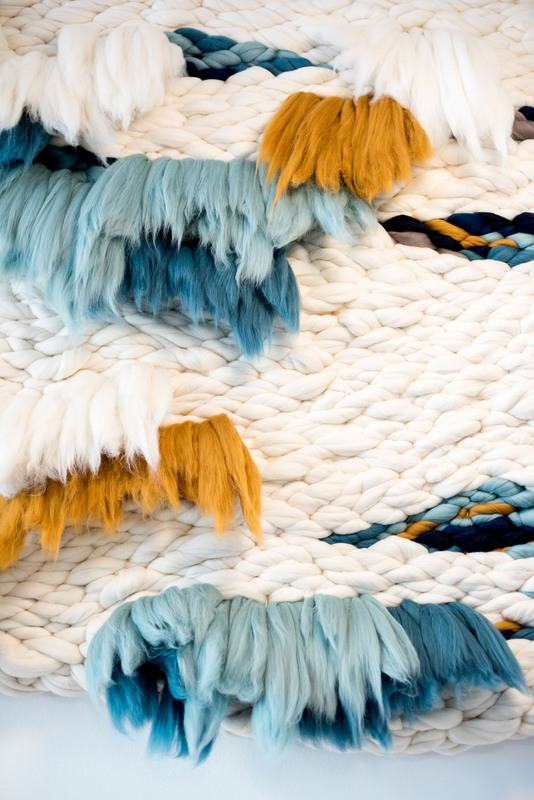 You refer to your aesthetic inspiration as the “new nostalgia.” What does that mean to you? I define “new nostalgia” as a modern spin on the familiar, a successful intersection of old and new. It’s a well-established point of reference that produces easy, fond memories, expressed in a fresh way that’s relevant in today’s culture. We were inspired by this philosophy because it genuinely defines Merchant Roots’ approach to hospitality: respect history while embracing a new and exciting approach. 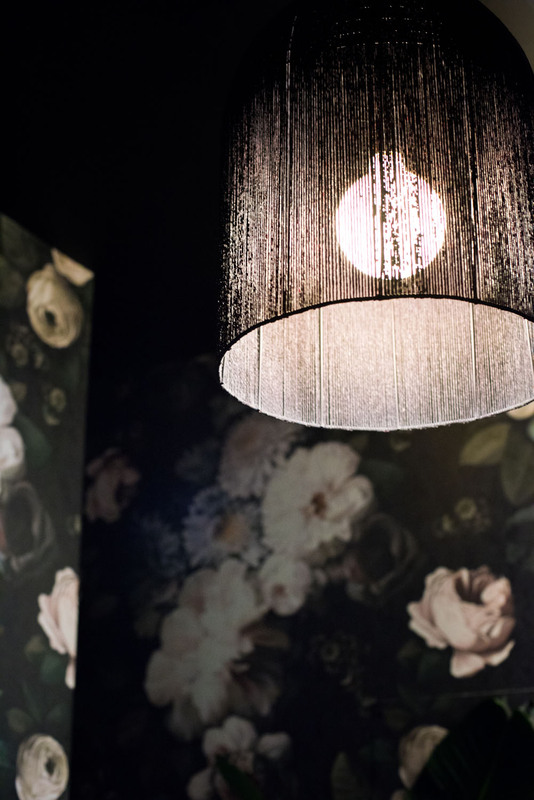 Our design employs a balance of vintage pieces and contemporary materials. 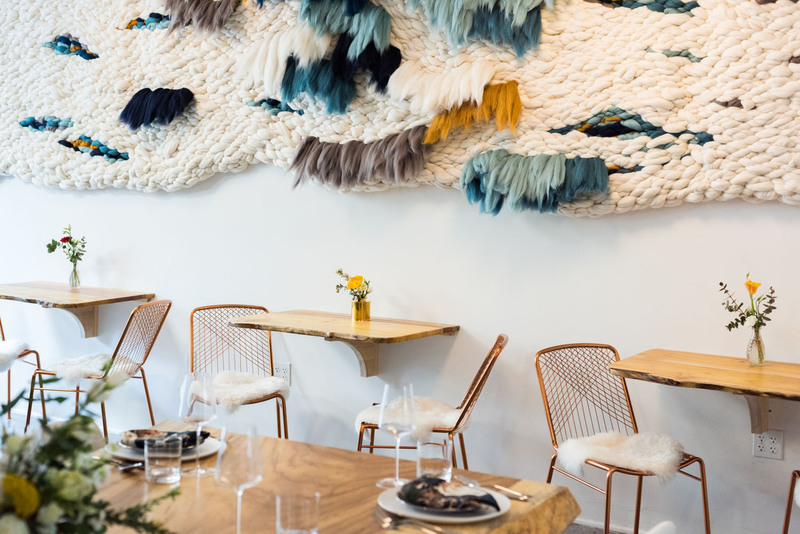 The space is bright with clean lines and neutral tones, finished cement floors, slate-colored herringbone tiles, and shiny copper fixtures, juxtaposed with elements that reference traditional, time-honored ways of making meat and pasta. We have a circa 1900 vintage sausage stuffer and an old wood and metal pasta maker that my business/life partner chef Ryan Shelton uses to make chitarra noodles that resemble guitar strings (chitarra is Italian for “guitar”). Merchant Roots’ hand-drawn logo, created and painted on our storefront by artist Ken Davis, embodies an old school spirit. On the food and beverage front, we utilize both old fashioned methods as well as new technology. We’re traditional in that we make everything in house and by hand, but we utilize contemporary equipment like our Thermador Masterpiece Freedom induction stovetop, which recognizes the shape of a pan, adjusts its heat level accordingly, and follows it when it is moved. In terms of wine, our collection includes old world wines, sourced from classic European winemaking regions, and some very non-traditional new world wines from North and South America, New Zealand, Australia, and South Africa.